Arabella Rodrigo is a London based singer, actress and vocal coach. 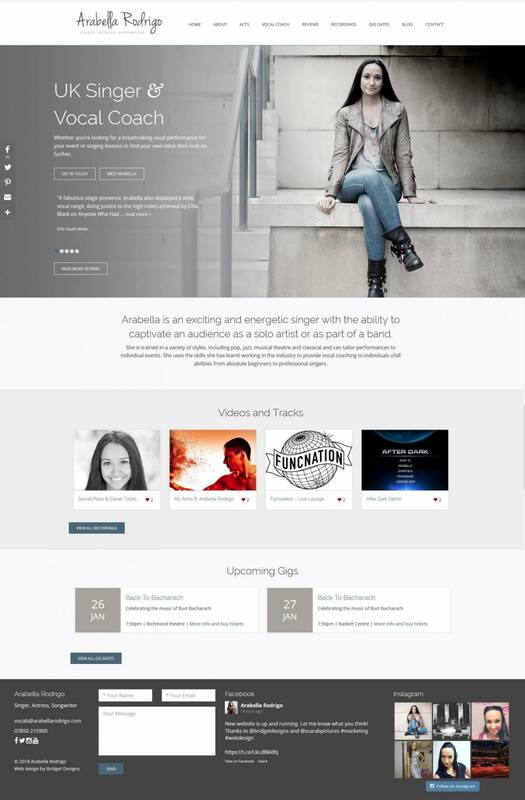 Arabella needed a website to promote herself, to get work and showcase her talents. The site features a clean, minimalist design using her stunning photographs as a basis. Other features include a gigs calendar, recordings listings, blog, and acts. The clean, sophisticated design has a muted palette and a calm feel. The design centres on Arabella’s beautiful photographs with simple bold lines and clean typography. The site is built using a content management system so that Arabella can update it easily herself. It includes links to her social media and a ‘like’ feature for her work. The project also included the logo design.